Last week in New York I got to attend a fun dinner party — about 16 folks, very diverse in terms of work, politics, interests, etc — all incredibly accomplished in their own fields. One of the things we talked about is this: “If you could be anywhere, where would it be?” Lots of answers — in the Alps. on a boat, on the beach, etc. When it came around to me, though, I gave a pretty boring answer: honestly, I mostly like being at home with my family, with time to spend with them. Anyway, for me Halloween always marks a transition into the part of the year that’s a headlong rush through Thanksgiving, Christmas, New Year — love the season, but it’s a bit of a sprint from here. Nice to get ready for it with a quiet morning together. Right at the moment, Kathy’s away, attending the funeral of a close family friend of ours — someone she’s known since college, and someone I’ve gotten to know a bit over the years, although she was much closer to him. It’s tragic to lose him — he was just 45, was an amazing husband and father and friend and practically an uncle to SPL. Tragic that he left behind an amazing wife and 6 year old daughter. And made more tragic because he died at his own hand, after suffering from depression. Kathy & I have really been struggling with it as everything’s unfolded this week — not even in the same universe as how the family’s affected, of course, but it’s caused a lot of soul searching and emotionally tough time. There are so many different aspects, each of which seems too gigantic to really get a handle on. How to understand it in the context of his life? How to help his wife and daughter? How to talk about it with SPL, who loved him so much? And how to think about it all in the context of our own lives? I think not too many of those questions are answerable quickly, or maybe at all, really. For myself, I have 3 main things I’m thinking about while Kathy’s at the memorial, celebrating his life. 1. Life can change profoundly for us in the space of a day, or an hour or a minute. Need to pay attention to now, need to enjoy those around us. 2. It’s an amazing thing to be with friends during a time of extreme emotional distress — it’s obviously so, so hard, but it’s also an opportunity for profound grace and dignity to show through, and that’s what’s manifestly evident this week with his wife and daughter. Such grace and strength in the face of so much uncertainty ahead. But mostly, we’ll miss him and the influence he had on everyone around him. He was always so generous, so engaged, so happy to share time and joy. Kathy & SPL especially loved spending time with him and his family so much. It’s about the bittersweetness and ephemeral nature of being a parent — the overwhelming feeling that I’ve had ever since SPL was born is happiness mixed with an acute awareness of how quickly time moves, how quickly SPL is changing and growing and developing. 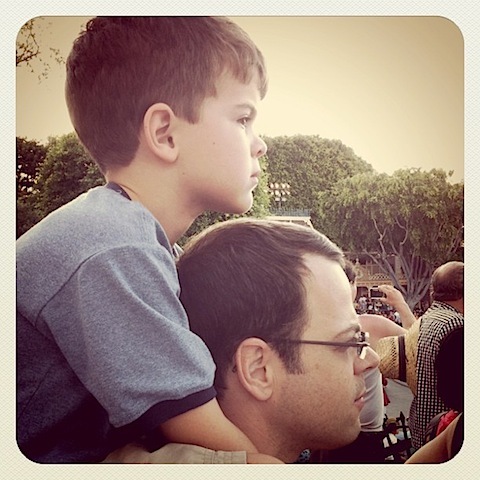 It seems to me that the essential nature of being a parent is building and creating, and then always letting go. Letting go of the kid that lived in your house yesterday, accepting that they’ve changed and are becoming the person they’ll be tomorrow. It’s been hard for me to explain to people without kids; it’s been universally & immediately understood by my friends with kids. 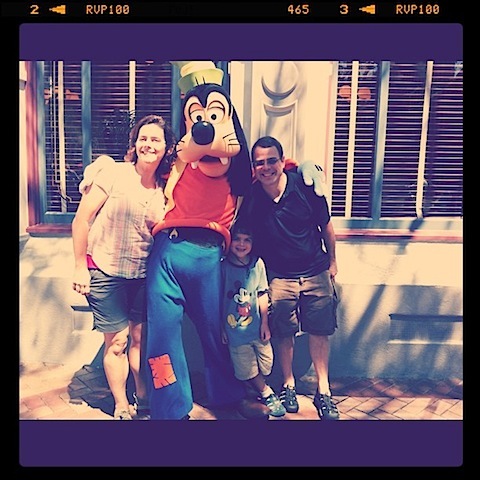 I’ll talk about it here in the context of our trip to Disneyland this summer. Now, it’s easy to be cynical about The Walt Disney Company and the various parks and properties that they run — and I’m often cynical myself about them. But I have to say that I really love going to Disney World and Disneyland — I always have — and I really, really love going with Kathy & SPL. I love being there, I love exploring with them, and none of the machinery of manipulation of the place really bothers me all that much. This year, with SPL being 6, was a fun mix of wanting to venture out on his own and wanting to hug tight to Kathy and me. It felt like we’re crossing a line towards more and more independence. So here’s a story in 4 pictures. Above and beyond everything else, the trip is a time that the three of us get concentrated, dedicated time with not much to worry about other than just being a family. One of the best parts about an experience like this is the combination of familiar and completely new things to experience together. Above is a picture of SPL & me watching one of the parades, talking about what we saw together, processing it together. 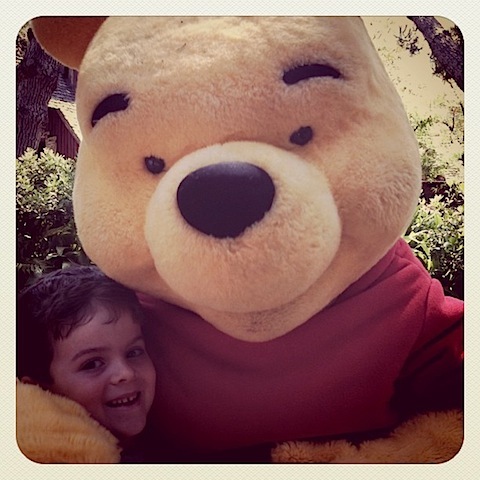 At just 6 years old, SPL still gets excited by the characters, loves hugs and holding close. We didn’t get too many pictures of it, but lots of times SPL grabbed onto Kathy and me — he’s still small enough that he wants the safety of his parents, and isn’t really 100% ready to take on the experiences by himself. 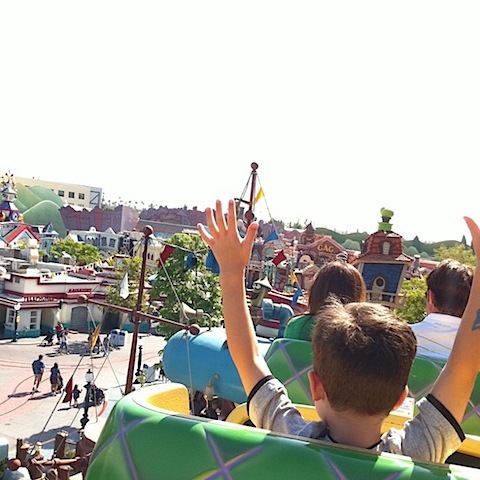 It’s on one of the smaller roller coasters in the park — in Toon Town, and this was the very first time he was able to ride the coaster by himself (I was in the seat behind, obviously). I just love this picture because it represents so much about the way SPL is beginning to engage with the world now — in an “arms up, even though it’s a little scary for me” mode. And as hard as it is when on the 2nd day of kindergarten he shoos you out of the room or runs away from you across the playground — and it is hard, and emotional — again, tough to describe to anyone without kids. As hard as that feeling is to experience, it’s also exactly, exactly the thing you want for your child. An eagerness to engage with the new, to run unafraid towards the unknown. So for me, that’s the essential quality of being a parent. Spending endless hours building and caring, and then just letting go and watching. The wisest thing anyone’s said to me since SPL was born is this: “The days are long, but the years are short.” That seems awfully right to me, and sort of wonderful, too.